Cook Your Way Through The S.A.T. Video Contest Voting Is Open Through April 10, 2012. 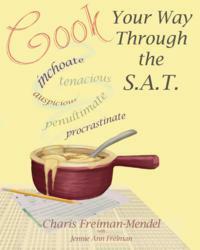 Help cookbook author Charis Freiman-Mendel spread the message that cooking makes learning fun. Cook Your Way Through The S.A.T. is available on Amazon, other online book sellers and in local bookstores. Memorizing word lists is b-o-r-i-n-g. "Cook Your Way Through The S.A.T." makes it fun. Five finalists have been selected for the "Cook Your Way Through The S.A.T." video contest and their videos are now available for viewing on the SATgourmet YouTube channel. The video most viewed by April 10, 2012 wins the $250 first prize and will be used to help highlight author Charis Freiman-Mendel's message that cooking helps make learning fun. "Cook Your Way Through The S.A.T." pairs each of 99 recipes with a "fun fact blurb," a short paragraph about the recipe. Each blurb contains ten vocabulary words that commonly appear on all standardized tests including the SAT, PSAT, ACT, SSAT, ISEE and CHSEE. The book helps teens and tweens learn 1000 vocabulary words and improve reading comprehension through a project-based activity that creates word associations and gives context to their meaning. No other test prep guide is a cookbook and no other test prep guide is so much fun! The videographers that entered the "Cook Your Way Through The S.A.T." video contest came up with original and creative ways to help Freiman-Mendel spread the word about her book. The finalists hail from four states across America and one from Canada. They produced videos that are engaging, funny and innovative. Finalist Alex Zakon submitted a wry video, as did Ross Scott, who animated his entry. Amber Stefanski waxed poetic, Justin Quinn featured his young cousin suffering through the standardized test, and Michael Ferandes used visual effects to enhance his video. Freiman-Mendel loves all five videos and is glad she doesn't have to pick the winner. That decision is up to viewers who share their favorite video with others. Freiman-Mendel invites students to forget those boring word lists and trash the flash cards. Start cooking with "Cook Your Way Through The S.A.T." and experience the SEAMLESS ACQUISITION of test prep vocabulary! There are many resources for learning vocabulary and improving test scores, but most make learning a chore. Only "Cook Your Way Through The S.A.T." makes learning fun. For great cooking, fun facts, project-based learning, new vocabulary and strategy for improving standardized test scores, order "Cook Your Way Through The S.A.T. and follow Charis through her blog, Facebook fan page and YouTube channel. To feature Charis in your news media outlet, please contact Charis(at)SATgourmet(dot)com.